Mom, the Intern: The Juice-capades! Day 1. Yes, I'm a Mormon. And I drink. Ok, ok, I'm just trying to be funny -- this really isn't as salacious as you think. See, I'm not knocking back dirty martinis or anything. I'm drinking juice. Actual fruit and vegetable juice. For my health. It all started a few months ago when, at my doctor's recommendation, I watched the documentary Fat, Sick & Nearly Dead. Sounds like a real party, right? When my doctor first mentioned it, I thought this film wasn't for me. Doc, take it easy. I'm not fat and I'm certainly not "nearly dead." I'll be fine! Really! I went on with my life, even though I didn't want to admit I was, in fact, a little sick. Chronic pain, fatigue, depression and even GERD. Hormone replacement therapy helped, but I noticed I was starting to tolerate my medication and was needing more. I didn't want to fall down that rabbit hole, but I also didn't know what else to do. I knew this documentary held the answers, but I just kept putting it off. Eventually, my sister-in-law Meg, who sees my same doctor and was also given this advice, convinced me I needed to watch it. She said it would change my life. She told me it was on Netflix and all I had to do was press play. So, at her prodding, I did. 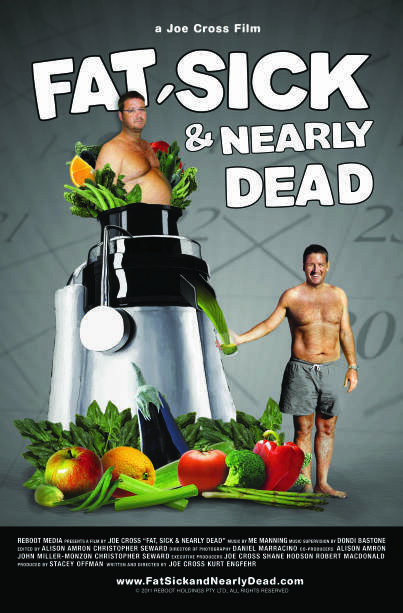 The documentary chronicles the "juice-capades" of Joe Cross, a successful Australian businessman whose upscale, busy lifestyle led to his becoming overweight and very ill. After failing to fight off a hideous skin rash and a host of other ailments, Joe decides (under his doctor's direction) to consume an all-juice diet in an effort to "reboot" his system and give his innards a chance to heal. He buys a fancy juicer and stops eating solid food altogether. At first, it's really tough for him and he wants to give up. But then, he becomes a believer, experiencing the healing benefits of fruit and vegetable juice. He decides to take a road trip across America, documenting his progress and educating the people he meets along the way. As I watched, I realized that I might be able to heal my own unexplained chronic pain, reflux and other issues through juicing. The more I thought about it, the more sense it made. I had eaten processed, sugary foods for so long, and even though my diet had improved drastically, my body needed a fresh start. It needed to heal, and what better way to help it along than by using the nutrients God put on this earth solely for that purpose? I mulled these thoughts over for months before I seized an opportunity last week to borrow Meg's Breville Compact Juice Fountain for five weeks while she's on vacation. I have no excuses now! To quote one of my favorite Imagine Dragons songs, "It's time to begin, isn't it?" My goal: to juice for a week straight. After a week of nothing but juice, I will gradually add regular whole foods back into my diet for another week or so, including animal products. So, yesterday was my first day juicing. I'm using the recipes on Joe's site, "Reboot with Joe." Some are definitely better than others. I drank one comprised of cucumbers, romaine, celery (which I despise) and pears that was ... less than delicious. But I made another one with beets that was surprisingly yummy (and hot pink)! And I have to say, it's really fun to watch the fruits and veggies turn into juice at lightning speed the second they meet the juicer. I haven't done anything this crazy in my entire life, but I'm ready for a change. I'll keep you up on all my progress as a "juicer" and I'll be sure to whine a whole bunch about wanting cupcakes and pizza as the week rolls on. And if you've juiced, be sure to leave me a good recipe or two! I'm open to almost anything, except straight celery. Because ... yuck. I watched that a few months ago and I've been wanting to try it ever since! totally makes sense to juice! I've been saving up to get an awesome juicer! good luck! The Breville Compact is only $100 and it's definitely doing the job! I recommend that one! Get it through Amazon and you might even be able to get it for less. I linked it in the top corner if you're interested! Thanks, Melanie! That was really helpful. This is so cool Jenna! I'm excited to hear how it goes for you! I really love juicing but I don't do it enough. I hope it does the healing your looking for! I'm so happy for you, Jenna! Good luck on your fast! I have never tried a juice fast, but I have been juicing once a day for about a month and a half now and it has helped me tremendously. Thanks for the link to Joe's website too! Good luck! I liked the Imagine Dragons quote. Went to their concert a couple of weeks ago and it was awesome! I have an uncle that got me to watch this a few weeks ago... I then saved up my birthday money and am now the proud owner of a Breville Juice Fountain... I'm slowly starting to incorporate juice into our diets (grad school leaves VERY little time for planning ahead like that) but I'm trying to plan a week in the near future where I do this same thing! I would love to see if it helps me with my allergies and migraines! I'm going to love seeing how it goes for you this week!!! Good luck, Lindsay! I think it will help you! Be sure to keep up with my blog because I'll have lots of helpful advice for you by the end of the week. I watched this last year and promptly scoured Craigslist for juicers and found a Champion masticating juicer for a great price. I then did a juice fast for 4 days and it seriously made me feel a lot better. I've pulled my juicer out and it's been sitting on my counter for a few weeks now because I just haven't gotten in gear to start juicing again. Your post has motivated me to get started again! One recipe I really loved was the Green Lemonade - 1 green apple, 2 cups spinach (~3 handfuls), 2 cups kale (~6-8 leaves), 1/2 cucumber, and 1/2 lemon. I'm sure you already know this but take the rind off of any citrus. Holy bitterness if you don't.